When you select a name that requires an apostrophe, such as O’Shea, from the drop down menu, you will notice that the apostrophe has been omitted. Do not worry; the selected name will be spelled correctly on the Irish coat of arms print with the apostrophe included when required. 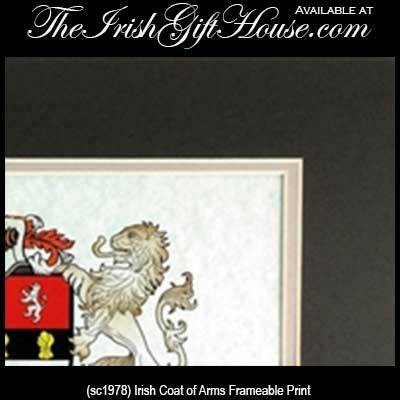 This frameable Irish Coat of Arms Print features a heavy 65lb cover weight parchment paper, heavy black backing board and two separate mat boards. The inside matting is clay color and the outside matting is a dark olive color. 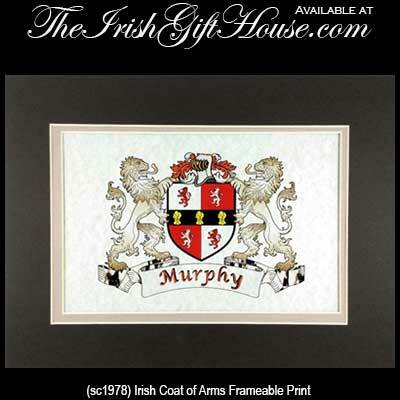 The Irish Coat of Arms print fits any standard 9" x 12" frame without any need for mounting. Choose from over 900 Irish names.